Panda Goldfish usually refers to the type of goldfish, which has a mix of white and black coloration on its body. Basically, there are 3 different variations, which you can find sold in the aquarium pet stores. One is the panda telescope with a pair of eyes that resembles the feature found on telescope goldfish. Another one is the panda oranda similar like a normal orange oranda with a hood that covers their eyes while the other variant is the veitail panda or sometimes known as butterfly panda. The veiltail panda is probably the most attractive of all, and coincidentally, they are also one of the rarest goldfish, you will ever find. There is no historical evidence that suggest that panda goldfish exist in the wild in its original form with the black and white coloration because they were actually produced out of selective breeding. Goldfish regardless of whether they are shubunkin, fantail or pearlscale, will interbreed as long as there is a chance for them to. 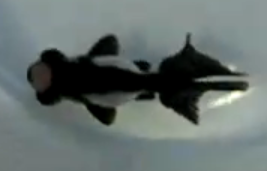 The veiltail panda goldfish for example, is probably a result of internal breeding between a normal veiltail goldfish with a black moor and that is why the panda goldfish still retains the long-trailing tail fin and the black coloration from the moor. Although, you can always find a new goldfish offspring that retains the mix of orange and black coloration, the white and black combination is somehow very tough to produce, probably why that makes the veiltail panda not easily available. The telescope panda is the most common out of those 3 types, which you can easily find offered for sale in aquarium stores. Although there is no explanation as to why this is so, most probably the genetic makeup that constitutes the two main features with the white and black color mix and the telescopes eyes genes are not easily suppressed when both the black moor and normal telescope interbreed. One thing to note is that despite the new features produced in the panda moor, they still maintain the same natural characteristics as in normal goldfish without any genetic abnormalities or defect. If you have intention to obtain a pure breed of telescope panda, what you need to do is to interbreed the same batch of offspring with one another so that you can get back the pure strain. Lastly, the oranda panda with the appearance of hood is also a special breed of goldfish that is also highly sought after although they are also quite rare in the market.